I have just started crocheting - with the lovely online help of some lovely Muslima Ladies. I thought I would share with you what I have made in the last few weeks. I did try to use patterns but unfortunately I still need some practise with this as I couldn't manage to follow them and just did my own style. I am quite pleased with the results considering I just kind of winged it! 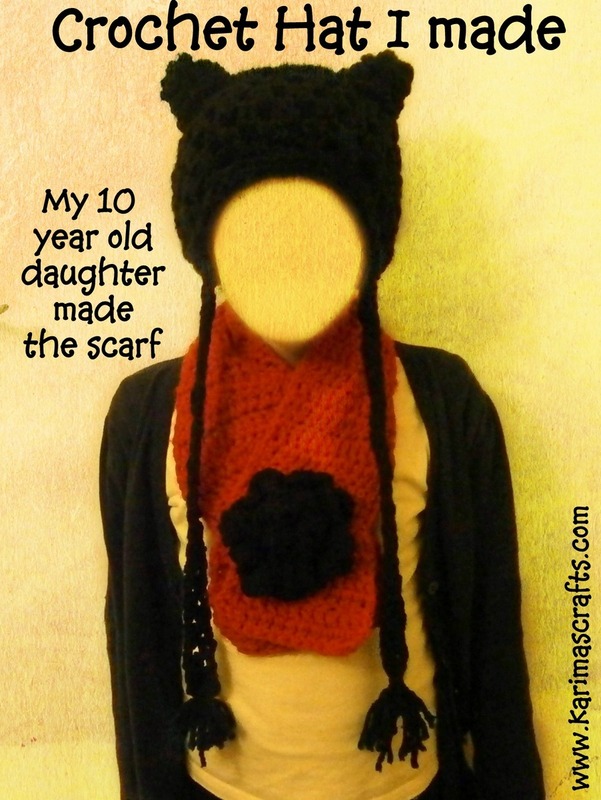 The photograph above shows a hat and scarf set I made for my 5 year old daughter. 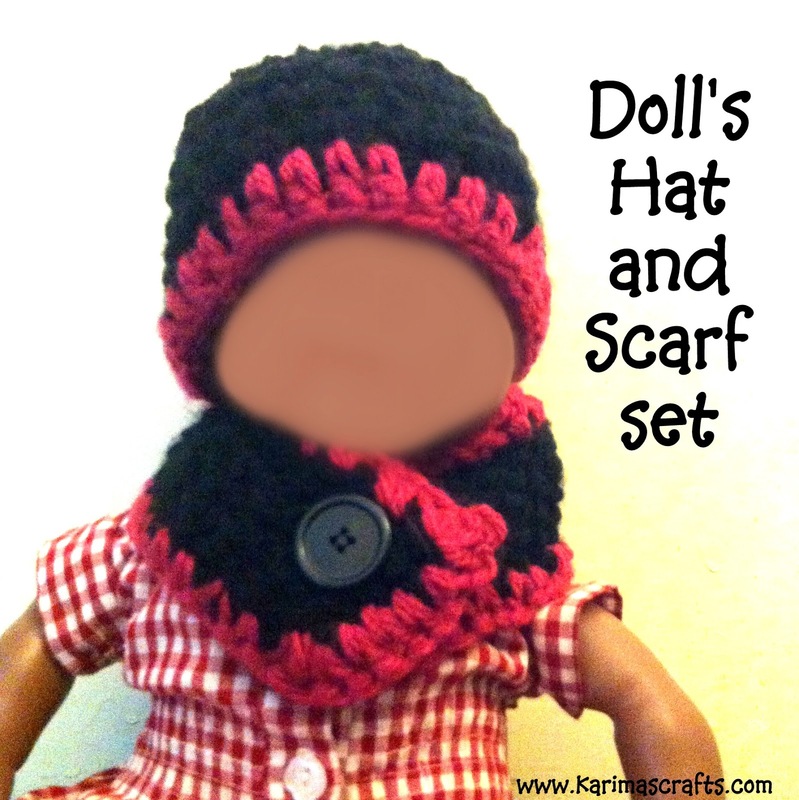 The photograph below shows a doll's hat and scarf set that I made for my daughter's doll. I used the same colour wool as the photograph above. The photograph below shows some slippers I made for my 5 year old daughter - also using the same coloured wool! The photograph below shows the very first hat that I attempted. I made this one for me. I tried to follow a pattern but couldn't manage but it still turned out OK for me. The photograph below shows a hat I made for my 10 year old daughter. She was so inspired by her hat that she decided to learn to crochet too. The scarf she is wearing was the first project she made. The flower below was my first attempt to make a large crochet flower. As of yet I don't know what to do with it! The photo below shows an ear warmer that I made for my 10 year old daughter. It was going to be a headband but I decided a large Ear Warmer would be better in this winter weather! Hopefully I will continue to start some more projects soon and share them with you, inshallah. Thank you Dana - I was really pleased with the outcome - hopefully inshallah I can learn more and make some more detailed things inshallah. Thank you, I so wish I had started crocheting a long time ago - didn't realise how easy it is once you get started. Masha'Allah look warm A for effot..
waalaikum salum, thanks for your comments - yes nice and warm for winter! Karima, you are very good!! This is really lovely.....you shoud keep going. Thank you Marie you are so sweet, I will try to pop by your blog later - been so busy lately! Hope you are keeping well. Assalmu alayki, Mashaallah sister they simply beautiful. Your soo talented mashallah tabarakillah. You should make and sell these. I surely would buy a set. waalaikum salam thank you for your lovely words. I was so pleased with the results - can't wait to learn more complicated things! InshaAllah you and the children are in good health and strong eeman. Waalaikum Salam, I love anything crafts so will try - and I love crocheting now! I am glad that you like it - this was just easy crochet stitches too! For a beginner Karima, mashaAllah your a natural! Amazing hats you made. I am so happy with them - such easy jobs too!